When Joanna asked me to write a guest blog post about our trip to Walt Disney World at the beginning of June, I was surprised and honored. However, I had a difficult time trying to figure out a topic to focus on. She had already done an amazing job detailing our trip. About a week went by when it finally struck me: the food! Since Joanna was unable to eat most of the trip, she wasn't able to talk very much about our meals. I should preempt this by saying that Joanna has the magical gift to have our table called whenever she went to clean up before dinner. She'd head to the restroom to wash up, and it never failed that our table would immediately be ready. It was pretty impressive, considering the lines that we saw in some locations. On our DHS day (arguably planned as the longest day with no breaks) we chose to fore-go a Table Service (TS) meal. As we got closer to our trip, we started thinking about this decision and the state of the Quick Service (QS) locations at that park. Personally, I find the QS locations at DHS to be lacking in food that I want to eat. The first reason is because when I travel on my own, I prefer not to eat Hamburgers and Chicken Nuggets. The other reason is that having a allergy to dairy, I have a hard time finding food that I can eat without having a reaction. After discussing this concern with Joanna, we decided to add another TS meal to our trip and just pay out of pocket for WCC. So, with the back-story set, let's begin our culinary trip! Having an early flight from Hartford to Orlando, I didn't really have a lot of time to make sure that I was well fed before my trip. I grabbed something quick to eat at the airport around 6am and hoped that it would last me until dinner time. Unfortunately, this plan proved to not be very sound. By the time I arrived at MCO, I was starving! However, Joanna and I had to find each other and catch our bus to Port Orleans Riverside so that we didn't waste too much time. By the time that we checked in, and made our way to Magic Kingdom, it was nearly 1pm. Due to how hungry we were, we made the executive decision to head to Pecos Bill's for a quick lunch. As I mentioned before, I tend to stay away from burgers. I ended up getting the BBQ Pork Sandwich. I enjoyed this sandwich as a hamburger alternative. It had a very flavorful sauce and the bun they served it on soaked up the excess without getting too soggy. Other than that, it wasn't really anything special. I ended lunch with the standard chocolate cake that is served at most of the QS locations. I'm not really a big fan of chocolate cake (or cake/cupcakes in general) but at this location the only other choices were heavily dairy-based. Next up on our tour was Liberty Tree Tavern. I have gone to LTT every year since I started visiting WDW on my own in 2007. However, this was my first time eating there for dinner, I always go for lunch when there is a normal menu. For dinner however, LTT switches to an All You Care To Eat menu of rolls, salad, turkey, pork, beef, stuffing, green beans, potatoes, and mac & cheese. I was really looking forward to this meal because my favorite food in the world in turkey. To be honest, I could eat turkey everyday and be perfectly happy. So, for this meal, I was actually surprised that I actually liked the beef and pork over the turkey. The rubs that they used on those meats were so flavorful! I also really enjoyed the stuffing, having a number of extra servings and the green beans as well. I left the mac & cheese for Joanna due to all the...ya know...dairy and such, so I'm unable to comment on that. It was very...cheesy looking. Before our waiter brought the dessert (warm apple crisp) I flagged him down to ask if we could have the ice cream that it came with in a separate bowl so that I could eat some of it too. He graciously fulfilled this request and I'm so very glad because the crisp was AMAZING! As we're eating our dessert, the waitstaff brings a birthday cupcake over to the pirate family sitting diagonally across from us. They ring the bell, give the announcement and I assume that they are done. Next thing I know, our waiter turns around and there's another cupcake in his hand and he's looking straight at me. It turns out that Joanna snuck my birthday onto all of our dining reservations! Arg!!! It was a pretty good cupcake, but I just couldn't eat it all after everything else that I had eaten that meal. Saturday was our day at DHS for Star Wars Weekends. DHS is my least favorite park, but I think that this was probably my favorite day. I started off by having breakfast at our POR's food court. Just the standard eggs, bacon, sausage and hash browns platter. It was nothing special, just enough to get me going. I'm a huge believer of having breakfast, lunch and dinner every day. Joanna is not so much a believer. After we arrived, we did a few rides, then Joanna decided that she wanted a cupcake. As she previously mentioned in her DHS post, she got the Red Velvet Cheesecake cupcake. 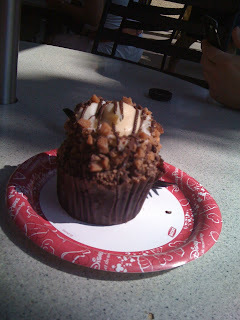 I can't say anything about the cupcake other than it looked insanely large and incredibly sweet. After the cupcake and walking around for a little while, our ADR for 50s Prime Time Cafe arrived. I was really excited that we decided to eat at this restaurant at the last minute. My family had eaten here back in 2000, and it was one of the things that I remember most about the trip. Joanna wasn't too excited about eating here because she didn't want to get picked on. The good thing about our meal here was that we had an amazing server! Cousin Cooper really fit the role well. He didn't overdo the scolding, and it was more a playful joking with us the whole time. My favorite part was when he started calling Joanna “Nemo” because she ordered two drinks when we arrived. I ordered the Sampler, which consisted of fried chicken, meatloaf and pot roast. Each of these items came with a small helping of the vegetables that they are typically served with. I also ordered a Vanilla Coke. I really dislike Coke, but I love Vanilla Coke. Weird, I know. Anyway...I was determined not to be the scolded for not eating my vegetables. Unfortunately, being the Yankee that I am, being forced to eat collard greens is not something that I was looking forward to. I'm sorry to all the fans of collard greens out there, but it was like eating a bunch of steamed oak leaves. They were easily my least favorite thing of the trip. I am proud to say, however, that I ate them all. Cousin Cooper was a little “annoyed” by how slow I was eating my greens, but he let me place my order for dessert anyway. He was a little surprised and teased me when I ordered the seasonal cobbler without asking what type of fruit was used in it. What he didn't realize was that every other item on the dessert menu was (one again) a dairy-based dessert. The cobbler was my only option that I had open to me. Oh well, it was awesome! It was a caramel apple cobbler, and even better than the one served at LTT the night before! After lunch, Joanna started to feel sick, so we split up. I rode Star Tours a few times, then got in line for the James Arnold Taylor show, which was awesome! By the time it finished, Joanna was feeling better, so she headed back to the park. We met up and I was hungry once again. We headed over to Studio Catering Company. As I mentioned earlier, I'm not a fan of the QS options at DHS. However, the Studio Catering Company offers the more unique options so if I have to eat somewhere, I usually end up there. I decided to get either the Pressed Tuscan or the Turkey Club sandwich. I can't really remember which, because it was an utterly forgettable sandwich. At this point, things start getting a little foggy for me. I believe that I had the breakfast platter that I had on Saturday again, then we headed to Epcot. We hit the big stuff that we wanted to, then we headed to Downtown Disney (DTD) for lunch. We decided to go to Earl of Sandwich, one of my favorite places to eat at DTD. I got The Earl's Club, which is my favorite sandwich ever. Turkey, bacon tomato, and I even let them leave the cheese on. There isn't very much on it, so it doesn't cause a reaction. I also got grapes to go with my sandwich. The grapes were sour, but oh so delicious! After heading back to the resort to drop stuff off, we headed back to Epcot. The first thing we did was stop at Club Cool for a nice refreshing Beverly. Ok, I can't keep a straight face on that one. While I don't have a problem drinking it in small doses, it does leave a very disgusting aftertaste that I can't stand. If you watched the first video that Joanna posted, you probably noticed the faces that I made after swallowing the stuff. Ok, let's see...Earl of Sandwich, Club Cool...that leaves Via Napoli! Man oh man was that a treat! Joanna and I started out by ordering a pitcher of Sangria. I'm not normally a fan of wine-based drinks but this was so good. Joanna didn't have very much of it, and I felt bad about not finishing the pitcher...so I finished it. I think Joanna was trying to get me drunk. Hmm... Next up, we ordered our pizzas. I got the Piccante pie, which was apparently new to the menu, and Joanna got the Margherita pie. Both pies looked amazing and I really really enjoyed mine. The sausage was spicy, but not too spicy. Just the way I like it! For dessert, I stayed safe and got the lemon sorbetto. Even though it was a very plain dessert to order, it was so delicious. The lemon flavor was very fresh, and was a nice ending to a spicy meal. Definitely worth it. Please join Joanna and I next time as I finish up the tour of our meals with Boma, San Angel Inn and Whispering Canyon Cafe! I really did have a knack for getting our tables called & the "Joanna is not so much a believer" made me crack up! Breakfast is best around 10 am for me. Hehe. Hope you don't mind that I put your birthday on all the reservations. ;-) I believe in FULLY celebrating one's birthday, but I might have gone a little overboard. I do admit that I enjoyed happily clapping along whenever they came to sing to Kyle to wish him a happy birthday! I LOVED 50's Prime Time Cafe because of Cousin Cooper, and the food was top notch too. 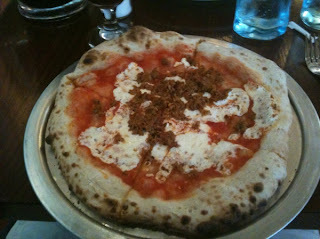 However, I really liked Via Napoli as well, but that was more about the atmosphere and fun conversation we had. Can I add that Kyle did drink quite a bit of the Sangria, but I swear I could hardly tell! Me, after 1.5 glasses, kept saying that I could feel it in my toes. Please tell me someone else knows what I'm talking about! LOL! Club Cool is great. Joshua & I always like the apple flavored soda. And it's free. Which always feels like a victory on a Disney trip.